The gorgeous artwork crafted by Native American tribes known as beadwork can be as intricate as the wings of a dragonfly. The allure of colorful glass beads against a dark, rich fabric is enough to catch nearly anyone’s eye. This fall, the James Watrous Gallery, a gallery at the Overture Center with a focus on contemporary Wisconsin artists, features these culturally significant, powerful works. The exhibit, which runs through November 6, showcases the raised beadwork of Oneida artists from Wisconsin who hope to maintain the Haudenosaunee, or Iroquois, tradition. The exhibit was founded in collaboration with the Oneida Arts Program and Oneida Nation Museum. The Oneida tribe of Wisconsin is among the most famous for their beadwork; for this tribe, raised beadwork has great cultural and historic meaning. Specifically, the Oneida suggest that beading keeps them connected to their homeland and heritage even after being relocated far from the rest of the Iroquois Confederacy. Folklorist Anne Pryor, a specialist in Wisconsin cultural tradition, had a major role in developing the Watrous Gallery’s Beading Culture exhibition, which displays the work of more than a dozen artists. She and others involved in founding the gallery hope that it demonstrates the large part art can play in constructing and defining community. 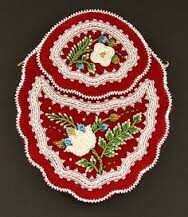 The practice of raised beadwork originated in the 19th century. It was widely practiced through the 1950s to meet tourist demand around the Niagara Falls area. However, as the market for beadwork decreased, so too did the practice itself. In the 1980s, a number of dedicated beadworkers revived the art. To this day, workshops, classes, and beading circles carry on the Iroquois tradition. And now, many regard such beadwork as a critical signifier of tribal identity. Native beadwork has evolved over the years, yet its poignant beauty has never changed. Head over to the Overture and check out this exhibit before it’s gone; you don’t want to miss it!